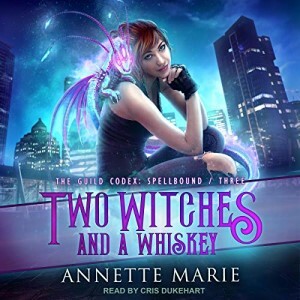 Two Witches and a Whiskey is book three in Annette Marie’s Guild Codex: Spellbound series. Tori is still working in the mythic world as bartender at the Crow and Hammer Guild. However, the Guild is being investigated by MPD after the actions of Tori, Aaron, Ezra & Kai from the last book. They are extremely interested in who the red haired girl is that was helping. Their presence and questions cause Tori to go into hiding. I felt like Tori was finally getting hit with the realization that I was expecting her to. She is not a mythic. That realization has her kind of down and questioning her position in their world. I figured that eventually that would get to Tori. I know it would bother me living in a world where everyone had magic but me. However, Tori gets a couple of visitors that bring her back into the mythic world. 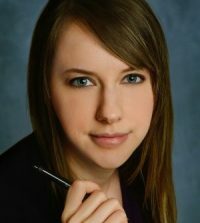 She ends up bringing the Guild into a job which of course she takes part in and ends up in trouble. It was great to see the Ghost played a fairly good sized part in the story. I really enjoyed him in Dark Arts and a Daiquiri and actually was setting him up in my mind as a love interest for Tori. Like I said before, even though this is an UF, I still try to create some sort of romance in my head. I was disappointed on this front, but that is not the book’s fault, that is my addiction to an HEA. I was really pleased with how everything came together. We are treated to a very intense conflict near the end which leaves us fretting for Tori’s life. I was kind of surprised, but happily by the end. Some of Tori’s issues were kind of a foreshadowing of what was to come for her, but it was good to see how it played out and everyone’s roles in it. Two Witches and a Whiskey was an enjoyable listen and I’m excited to see what is next in store for the Crow and Hammer Guild and Tori. The narration with Cris Dukehart was great, as usual. The narrator really had a great voice for these characters. You can hear the emotions Tori goes through as well as her age. I will say I sometimes had trouble telling the difference between Aaron and Kai but that was minor. Definitely recommend the audio format for this series!